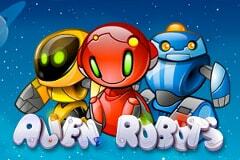 When you think of aliens you probably think back to a television show or movie you watched where they were hell-bent on wiping out humanity, however in a tribute to robot fans using software by Net Entertainment (NetEnt), the Aliens Robot video slot combines aliens and robots to create a quirky encounter that promises to see players return to Earth safe and sound. This Sci-Fi themed slot consists of 5 reels with 3 rows and you can choose to play with between one and thirty win lines active or you can showcase your bravery by taking a leap and activating 243 ways to win instead which will see your stake double, with £150 being the max bet available as you blast off to outer space in a UFO. On board the UFO you will hear sonar sounds ring out loudly from a radar system along with the beeping and mechanical noises of six colourful robots who you are accompanying on a space-age adventure as you gaze out the window at a myriad of twinkling stars. Fingers crossed they take a liking to you as if they do you could win up to 50,000 coins – a feat which is made a little easier if you trigger the sensational free spins mode which boasts Expanding Sticky Wilds with reel re-spins to provide you with wins that are out of this world! The symbols on the pay table of this free Alien Robots slot accentuate the fun-filled adventure you’re set to have inside a UFO in outer space and you’ll even get to see what groovy movers your fellow passengers are as they celebrate your wins. Speaking of wins, the values you receive will depend on whether you are playing with betting lines or ways to win active so make sure you reference the pay table before spinning the reels no matter whether you play for free or play for real money. The captain of this UFO is a pink-eyed robot with a transparent green head that enables you to see its brains. Not only does he guide the UFO in the correct direction, he will also wield his powers as the Wild symbol to substitute for all other symbols aside from the Scatter (represented by the UFO blasting off) and it has very special powers in the free spins feature, but more on that later. The cute red robot with green eyes is worth the most as it sits perfectly still while nodding its head, the orange and white robot stands in an intimidating manner before snapping its pincer-like hands together, the bright yellow robot with a wheel for feet holds out its hands to balance, there is a green and white dog which barks, and finally you will also get the opportunity to meet a blue robot which navigates its way around the UFO thanks to rubber tracks like you see on diggers. Rounding off the symbols on the pay table are Ace to 10 icons which have the lowest values of all and they have been designed in a colourful pixelated manner. The Scatter symbol is one of the most visually impressive on the reels of Alien Robots and you’ll certainly be impressed when you see three or more of them on the reels at the same time as they bring a delivery of free spins for you to enjoy. Three Scatters see you receive 10 free spins, four of them will bring you 20 free spins while five of them appearing at once earns you a colossal 50 free spins, however you’ll have to be really lucky for that to happen from my experience. The other special Wild powers possessed by the captain of the UFO become clear to see during the free spins feature as each Wild symbol that appears will become and Expanding Sticky Wild to cover the whole reel before a re-spin occurs to provide you with even more opportunities to win big! Lots of casino slot machines based on aliens and robots have been released, however this combination of them both certainly offers a fun-filled experience in outer space. Despite the bright and vibrant reels, the quirky sound effects, the groovy robots that you blast off with and the exciting free spins feature, I personally prefer the mesmerising Cosmic Fortune slot which is based on an alien invasion as it offers substantially higher prizes!